If the primary fault line in Israel is between Israeli Jews and Palestinians, we should not overlook the racism within the Israeli Jewish population. Ethiopian Jews and Black Hebrews also experience extreme discrimination and brutality at the hands of the state . The attack below by the Border Police, who are known for their brutality, on a Black Israeli is typical. As the article points out, a death squad of Border Police had killed an unarmed and defenceless Palestinian inside Hebron’s hospital the previous day. 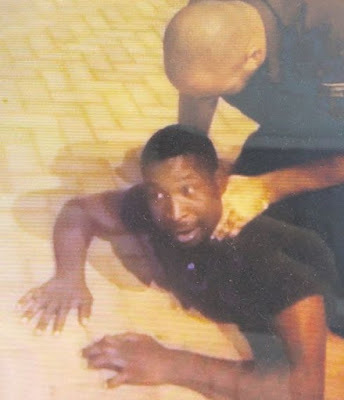 An Israeli border Police officer brutally assaulted a Black Hebrew Israeli citizen at a security checkpoint in Eilat. The victim, Yair Israel and his wife Anat, were en route to a local hotel where he had planned a relaxing weekend celebrating his wife’s birthday. Israel is a well-known businessman in Dimona, where he runs a natural foods boutique, Otentivee (“Authentic Natural”), whose products are known by vegetarians throughout the country. He’s been interviewed on a number of Israeli TV shows where he’s showcased his passion for natural and organic products. The brutal attack would’ve been just another anonymous, unseen incident of Israeli official racism had not, Oded Zamora, an Israeli native who has lived in Maryland for the past 14 years, been in the car following Israel at the checkpoint. As he saw the attack unfold, Zamora bravely exited his own vehicle and asked officials why the attack was happening. When no one responded he took out his cellphone and began videotaping. He told the attacker that he was filming him. Unfortunately, this did nothing to abate the assault, which increased in ferocity. The entire incident began with a policeman asking Yair to present his ID. He did so. Then the policeman asked for his wife’s ID. Though he found this unusual, he then presented his wife’s ID. At this point, a Border Policeman who was sitting inside the security booth came on the scene and began shouting angrily at Yair: “What’s your problem?” Then the attack escalated. The Border Policeman began punching him. He tried forcing Yair’s car door open. So the victim opened the door for him. He then grabbed him and ejected him from the vehicle, continuing to brutally strike him. He then dragged him behind the security booth where he beat him even more. The entire scene unfolded in front of the victim’s wife, who was forced to see her own husband brutalized by a bully in uniform. Both the victim and witness attest that the former did nothing to provoke the attack, that he continually asked in a civil manner why he was being assaulted, that he told the security forces then he was a citizen of Israel and had at a local business. None of this helped at all. Eventually they handcuffed Israel, who repeatedly asked them why he was being arrested and received no answer, and took him to the local police station. At the station, he was questioned but could not explain to them what he had done to provoke the attack. He was taken to the investigations unit and after two or three hours released. After her husband was taken away from the checkpoint, Anat was told by the police to leave the scene. She told them she had no driver’s license. They told her that as far as they were concerned she could walk to Eilat. Zamora then ran to his car and called his sister who is a member of a local kibbutz in Eilat. He told her to drive urgently to the checkpoint. He said that if he was no longer there, she should drive immediately to the police station. When she arrived, Zamora asked his sister to drive Anat to the Kibbutz while he drove to the police station to be with Yair. Oded Zamora is a true mensch. He stood up to injustice without fear. Some, but likely very few Israelis would’ve done the same. So if there are any readers who are going to say that Zamora’s courage redeems redeems Israel or shows it to be a decent, liberal, humane society–think again. He likely intervened because he’s been living in the U.S., where we are becoming less & less tolerant of police abuse and executions. Even if that’s not the case, the individual righteousness of citizens cannot compensate for the overall evil that infects the official state apparatus. This is not a one-off act of racism by an lone-wolf Israeli police bully. This is official racism and brutality. This is official sanctioned violence by the state against its own citizens. Though they happen to be citizens who are not White and therefore not worthy of the full rights of every other Israeli citizen. 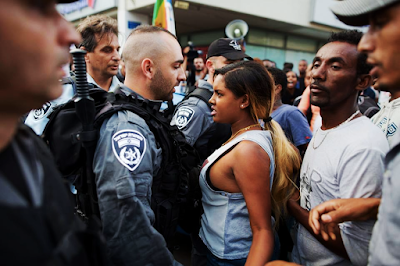 Israel is a state seeped in racism and violence: not just against Palestinians (which is half to be expected) but against its own Palestinian and Black citizens. I’ve often remarked here upon the special reputation for brutality and cruelty “enjoyed” by the Border Police. They take torture to an entirely new level. The assassination in a Hebron hospital a few days ago was perpetrated by a Border Police death squad, Yamas. This must end. There is only one way to do it: Israel must become a state of all its citizens. Everyone must be treated the same. No person, religion or ethnicity deserves superior treatment. Separation or privilege based on these criteria must be rooted out. I am not saying that religion should be rooted out, just that religions must be treated the same. They must all receive respect and none treated better or differently the other. And no religion may replace the state or supercede the state or compel the state to act politically to achieve a religious objective. Religions must occupy a spiritual space, not a political one. Israeli Border Police spokesperson responded to the charges against his force by claiming that the level of force used in the incident was proportional and reasonable. He lied, claiming that Israel refused to identify himself and attacked the officers. He further claimed that while the victim was being arrested he continued to resist. There is no evidence whatsoever to support his account and the video completely repudiates this version. Further, it makes no sense whatsoever that an Israeli citizen at a checkpoint would refuse to identify himself. Every Israeli understands security protocols and why they’re necessary. No one refuses to participate. With a straight face, the flack noted that because of this incident, the Border Police were asking all citizens to behave with restraint and to coöperate fully with security forces so that they could perform their duties. No one can get Israeli border police to except any responsibility for its actions. It is above the law, because it is the law. Further, the spokesperson claimed that Zamora had interfered with the arrest. He also falsely claimed that the police asked him to accompany them to the station as a witness to the event and because the video was evidence. When he refused, he too was detained and brought to the station. “I am the second generation born in this country. And I must continue to fight for change because there are new generations behind me. I must not give up because the generation before me suffered from the same things, but had no power to change anything. God gave me the strength to fight this so that it won’t happen again. For yet another example of the grievous suffering inflicted on the Black Hebrew community, this time by the IDF, read of the suspected murder of Toveet Radcliffe, a young woman serving in the army. It claimed she committed suicide by shooting herself with her own rifle. H/t to David Sheen and Ofer Neiman.